T cells develop functional defects during HIV-1 infection, partially due to the upregulation of inhibitory receptors such as programmed death-1 (PD-1) and CTLA-4. However, the role of lymphocyte activation gene-3 (LAG-3; CD223), also known as an inhibitory receptor, in HIV infection remains to be determined. In this study, we revealed that LAG-3 on T cells delivers an inhibitory signal to downregulate T cell functionality, thereby playing an immunoregulatory role during persistent HIV-1 infection. We observed that HIV-1 infection results in a significant increase in LAG-3 expression in both the peripheral blood and the lymph nodes. The upregulation of LAG-3 is dramatically manifested on both CD4+ and CD8+ T cells and is correlated with disease progression. As expected, prolonged antiretroviral therapy reduces the expression of LAG-3 on both CD4+ and CD8+ T cells. The ex vivo blockade of LAG-3 significantly augments HIV-specific CD4+ and CD8+ T cell responses, whereas the overexpression of LAG-3 in T cells or the stimulation of LAG-3 on T cells leads to the reduction of T cell responses. Furthermore, most LAG-3 and PD-1 are expressed in different T cell subsets. Taken together, these data demonstrate that the LAG-3/MHC class II pathway plays an immunoregulatory role, thereby providing an important target for enhancing immune reconstitution in HIV-infected patients. Additionally, the LAG-3/MHC class II pathway may synergize with PD-1/PD ligand to enhance T cell–mediated immune responses. Human immunodeficiency virus–specific CD8+ T cells are known to play critical roles in the containment of HIV-1 replication (1–3). HIV-1 infection could result in a progressive impairment of HIV-specific CD8+ T cells, potentially causing functional exhaustion in the late stage of infection (4, 5); however, the mechanism underlying this observation remains elusive. It has been shown that HIV-specific CD8+ T cells are subjected to functional regulation by inhibitory molecules such as programmed death-1 (PD-1), CTLA-4, 2B4 (CD244), B and T lymphocyte attenuator, CD160, and Tim-3 (6–14). Previous reports demonstrated that PD-1 was significantly upregulated on virus-specific CD8+ T cells and that CTLA-4 was upregulated on HIV-specific CD4+ T cells during persistent viral infection; both PD-1 and CTLA-4 could negatively regulate T cell functionality (6, 7, 15). Similarly to CTLA-4 and PD-1, lymphocyte activation gene-3 (LAG-3), which is a natural high-affinity ligand for MHC class II (MHC II) molecules (16), was shown to play an inhibitory role in regulating T cell immune responses by several studies (17–21). Accelerated autoimmune diabetes was documented in the absence of LAG-3 in NOD mice (22). LAG-3 acted synergistically with PD-1 to regulate T cell function (23), and the synergistic actions of these two molecules were critical for the prevention of autoimmunity in mice (24). In a murine transplantable tumor model, it was observed that PD-1 and LAG-3 were coexpressed on tumor-infiltrating CD4+ and CD8+ T cells (23). Plasmodium infection induced T cell exhaustion, which could be restored by the blockade of PD ligand 1 (PD-L1) and LAG-3 in vivo; blocking PD-L1 and LAG-3 restored CD4+ T cell function, amplified the numbers of follicular helper T cells, enhanced protective Abs, and rapidly cleared the established blood-stage Plasmodium infection in mice (25). LAG-3 also defines an active CD4+CD25highFoxp3+ regulatory T cell subset, the frequency of which is enhanced in the PBMCs of cancer patients (26). There is increasing evidence of the role of LAG-3 and its involvement in regulatory T cell functions (27, 28). However, less is known on the role and function of the LAG-3 pathway during HIV-1 infection in vivo. LAG-3 is expressed on activated CD4+ T and CD8+ T cells. After binding to its ligands, LAG-3 negatively regulates T cell signaling via interaction with the TCR “CD3 complex” (18–21) and controls the size of the memory T cell pool (29). Although chronic HIV persistent infection signaling resulted in T cell functional exhaustion, the general underlying mechanism and the specific involvement of LAG-3, as an inhibitory molecule, in T cell depletion/injury in the peripheral blood in chronic HIV-1 infection remain largely unknown. In this study, we measured LAG-3 expression in HIV-1–infected subjects and examined the association of LAG-3 with disease progression. We also assessed the effect of blocking LAG-3 ex vivo on T cells. 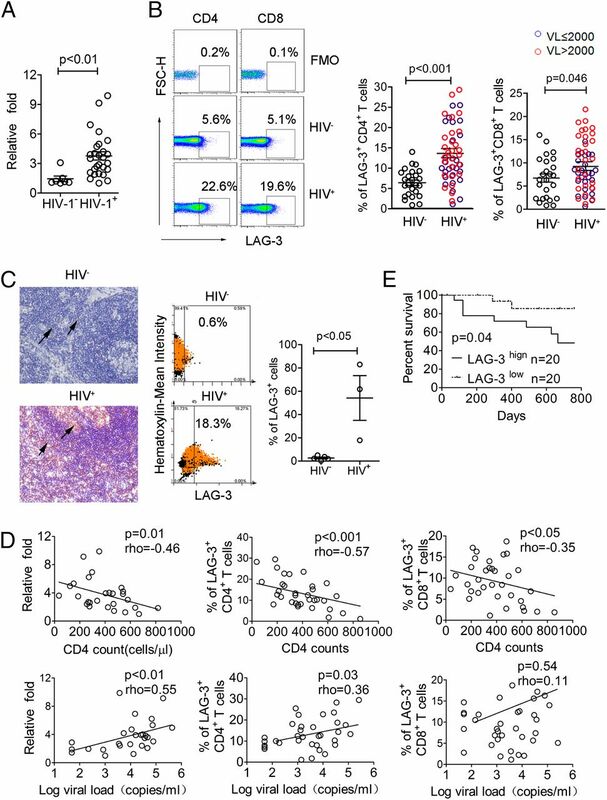 Our data show that LAG-3 plays a regulatory role on both CD4+ and CD8+ T cells and is associated with disease progression during HIV-1 infection. These data could have important implications for targeting LAG-3 as a potential immune intervention target to restore T cell function during HIV-1 infection. Fifty-four HIV-1–infected individuals were enrolled in our study. Human subject protocols were followed as previously described (30). The lower detection limit for HIV-1 RNA is 50 copies/ml. Twenty-five HIV-seronegative subjects were recruited as healthy controls. The demographic information and clinical characteristics of the subjects are listed in Table I. Written informed consent was obtained from all participants. The overall study was reviewed and approved by the Ethics Committee of the Shanghai Public Health Clinical Centre to ensure the protection of human subjects. Human and rhesus macaque PBMCs were isolated from freshly heparinized blood. To characterize the phenotypes of LAG-3+CD4+/CD8+ T cells, PBMCs were stained with Pacific Blue–conjugated anti-human CD3 Ab (clone UCHT1; BD Biosciences), PerCP-Cy5.5–conjugated anti-human CD4 (clone SK3; BD Biosciences), allophycocyanin-H7–conjugated anti-human CD8 (clone RPA-T8; eBioscience), FITC-conjugated anti-human CD38 (clone HIT2; eBioscience), allophycocyanin-conjugated anti-human PD-1 (clone EH12.2H7; BioLegend), Pacific Blue–conjugated anti-human CD95 (clone DX2; eBioscience), PE-Cy7–conjugated anti-human CD45RA (clone HI100; eBioscience), allophycocyanin-conjugated anti-human CCR7 (clone 3D12; eBioscience), PE-conjugated anti-human LAG-3, and allophycocyanin-conjugated anti-human LAG-3 (polyclonal Ab; R&D Systems) Abs. HIV-1 Gag-SLYNTVATL– and Pol-ILKEPVHGV–specific CD8+ T cells were identified using HLA-A*0201 tetramers, and HIV-1 Env-RYLKDQQLL– and Nef-RYPLTFGWCY–specific CD8+ T cells were identified using HLA-A*2402 tetramers (QuantoBio). The Live/Dead blue dye (Invitrogen) was used to exclude dead cells. The cells were then washed and fixed in PBS plus 1% paraformaldehyde. A total of >200,000 events were collected and analyzed using a FACSCalibur flow cytometer (Becton Dickinson) and FlowJo 7.6 software. PBMCs were treated with anti-human CD274 (B7-H1) Abs, also known as anti-human PD-L1 (clone MIH1; eBioscience) (2 μg/ml), or mouse IgG1κ isotype control (eBioscience) (2 μg/ml), recombinant human LAG-3–Fc chimera (R&D Systems) (2 μg/ml) in the presence of overlapping HIV-1 clade B Gag pooled peptides (B Gag) (2.5 μg/ml, National Institutes of Health AIDS Research and Reference Reagent) or CMV/EBV/influenza virus (CEF) pooled peptides (AnaSpec) (2.5 μg/ml). Staphylococcal enterotoxin B (SEB; Sigma-Aldrich) (0.5 μg/ml) was used as positive control. After 24 h of incubation, the cytokines IL-2, IL-10, and TNF-α were measured by flow cytometry with the cytometric bead array (CBA) human Th1/Th2/Th17 cytokine kit (BD Biosciences) by following the manufacturer’s protocol; IFN-γ was measured using an ELISPOT assay (BD Biosciences). After fixation and permeabilization (Fix/Perm kit; BD Biosciences), intracellular cytokine staining (ICS) was performed with allophycocyanin-conjugated anti-human IFN-γ (clone 4S.B3; BioLegend) and the corresponding Abs against surface markers. To track cell division, PBMCs from chronically HIV-1–infected individuals were labeled with 5 μM cell proliferation dye eFluor 670 (eBioscience) in PBS and incubated for 10 min at 37°C. Labeling was quenched by the addition of five volumes of cold complete media (10% FBS in RPMI 1640) on ice for 5 min. The labeled cells were then washed twice and resuspended in RPMI 1640 (Life Technologies). Cell proliferation dye eFluor 670–labeled cells were then stimulated for 6 d in the presence of HIV-1 B Gag peptides or SEB plus recombinant human IL-2 (50 IU/ml) (R&D Systems), 2 μg/ml IgG, or anti-human PD-L1 or LAG-3 Fc and replenished every 2 d. The cultures were restimulated after 6 d, and cell proliferation was measured on day 7. Total RNA was extracted from peripheral blood of the subjects using the PAXgene blood RNA kit (Qiagen) following the manufacturer’s protocol, and then transcribed into cDNA using oligo(dT) with Moloney murine leukemia virus (Invitrogen). The quantitative expressions of LAG-3 transcripts were subsequently determined using SYBR Green real-time PCR master mixes (Invitrogen). The sets of primers were designed for the quantitative PCR with the primer design software Primer Premier 5.0. The sequences of the forward and reverse primers for LAG-3 mRNA are 5′-TCACTGTTCTGGGTCTGGAG-3′ and 5′-GGTAAAGTCGCCATTGTCTC-3′, respectively. For GAPDH mRNA, the forward and reverse primers are 5′-AATGGGCAGCCGTTAGGAAA-3′ and 5′-GCCCAATACGACCAAATCAGAG-3′, respectively. The reaction conditions were as follows: 95°C for 2 min, followed by 40 cycles of 95°C for 15 s, 60°C for 15 s, and 68°C for 25 s. A final dissociation step was run to generate a melting curve to verify the specificity of the amplification product. Quantification of the target gene expression was performed using the 2−ΔΔCT method according to the manufacturer’s instructions (Applied Biosystems). LAG-3 was cloned by RT-PCR, and the chimeric gene was generated by fusing the intracellular domain (IC) of LAG-3 to the extracellular and transmembrane domains of murine (m)CD28 (designated as hlag-3-IC/mcd28). All genes were confirmed by PCR and sequencing. Both genes were inserted into the transferring plasmid pCLPs. Lentiviral vectors were produced after the transfection of 293T human embryonic kidney cells with three plasmids; for sorting, this system encodes an enhanced GFP (eGFP) protein or mCD28. Cells were transfected with VSV-G (envelope), pSAX (packaging plasmid), and pWPI (transfer plasmid) or pCLP (transfer plasmid) using the TurboFect transfection reagent (Thermo Scientific; R0531). High-glucose DMEM was replenished 6 h after transfection, and the viral supernatant was harvested at 48 h posttransfection. Subsequently, 250 μl lentivirus was incubated with Jurkat cells and DEAE-dextran (15 μg/ml) on 24-well plates at 37°C. On the following day, the medium was exchanged and the cells were expanded. After 48 h, LAG-3 gene expression was examined and eGFP+ or mCD28+ cells were sorted by flow cytometry. The cells were then passaged for further screening to identify the stable expression of eGFP alone (vector control) or in combination with LAG-3 or mCD28. CD8+ T cells of HIV-infected individuals were purified using magnetic negative selection for CD8+ T cells, following the manufacturer’s protocols (StemCell Technologies). The plasmid DNA pWPI or pWPI-LAG-3 was transfected into purified CD8+ T cells using the Nucleofector II device (Amaxa) and Amaxa T cell transfection reagents (Lonza) according to the manufacturer’s directions. CD8+ T cells were nucleofected with either pWPI or pWPI-LAG-3 using the Nucleofector II device (program U014) and Amaxa human T cell transfection reagents (Lonza). Forty-eight hours after nucleofection, the cells were incubated with HIV-1 B Gag pooled peptides, and ICS was performed with anti-human IFN-γ and corresponding Abs against surface markers. Histological analyses were performed on formalin-fixed, paraffin-embedded tissues. Lymph node samples were obtained from the Department of Pathology at Shanghai Public Health Clinical Centre. Human lymphoid tissue (formalin-fixed, paraffin-embedded) was stained with mouse anti-human LAG-3 (clone 17B4; LifeSpan BioScience) Abs (5 μg/ml), followed by the EnVision G|2 Doublestain System, rabbit/mouse (diaminobenzidine+/permanent red) (DakoCytomation), according to the manufacturer’s instructions. Representative images showing LAG-3 immunohistochemical staining were generated using custom software from Tissue Gnostics (HistoQuest 3.0.3.0148). All slides were digitally scanned at ×20 magnification with use of a ScanScope CS slide scanner (Olympus CKX41). Chinese-original rhesus macaques (Macaca mulatta), aged 4–6 y, were housed in biosafety level 3 containment facilities at the Institute of Laboratory Animal Science, Chinese Academy of Medical Sciences and Peking Union Medical College and were maintained in accordance with the standards of the Association for Assessment and Accreditation of Laboratory Animal Care International. Animal experiments were approved by the Institutional Animal Care and Use Committee of Institute of Laboratory Animal Science, Chinese Academy of Medical Sciences and were conducted according to the principles described in the Guide for the Care and Use of Laboratory Animals of the Institute of Laboratory Animal Science (from 2006) and the use of nonhuman primates in research of the Institute of Laboratory Animal Science (from 2006). All of the animals selected for this study were negative for simian retrovirus type D, SIV, simian T lymphotrophic virus type 1, simian herpesvirus B, tuberculosis, and parasites (e.g., Endamoeba), in accordance with national regulations (GB14922-2001). All 25 macaques were anesthetized with ketamine hydrochloride or compound ketamine (10 mg/kg) injected i.m. and were i.v. (n = 12) or intrarectally (n = 13) challenged with SIVmac239 at a dose of 1 × 105 50% tissue culture–infective dose. Peripheral blood was collected at 94 d postinfection for immune responses. The control macaques were SIV− (n = 9). All data were analyzed using the FlowJo 7.6 software. Significant differences between two groups were assessed by the Mann–Whitney nonparametric test. Data from the same individuals were compared by the Wilcoxon matched-pairs t test. Correlations between variables were calculated using a Spearman rank correlation test. For all tests, a p value < 0.05 was considered statistically significant. Microarray data were from Gene Expression Omnibus (http://www.ncbi.nlm.nih.gov/geo/) under accession no. GSE56837. The upregulation of LAG-3 was demonstrated in a previous study on tumor-infiltrating CD8+ T cells (31). Using a microarray, we profiled LAG-3 expression on PBMCs from a cohort of chronically HIV-1–infected and seronegative subjects. The upregulation of LAG-3 was observed in HIV-1–infected individuals compared with HIV-seronegative subjects (data not shown). To confirm the microarray data, we quantified LAG-3 mRNA by real-time PCR in 7 uninfected and 27 HIV-1–infected subjects naive to antiretroviral therapy (ART). The results showed that LAG-3 expression (normalized to GAPDH) was significantly higher in HIV-1–infected subjects compared with uninfected subjects (p < 0.01) (Fig. 1A). 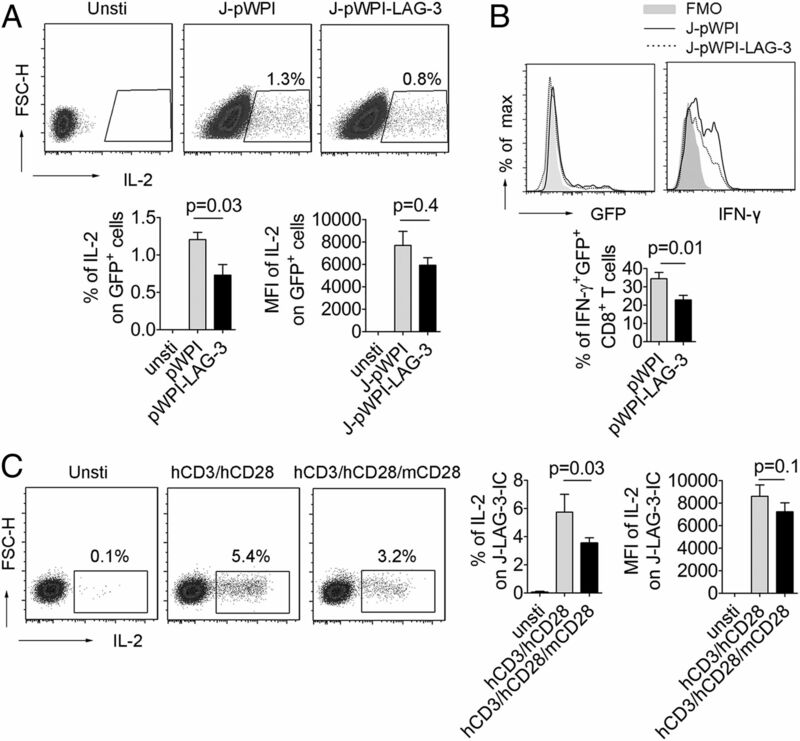 LAG-3 is significantly upregulated in lymphocytes in HIV-1–infected subjects. (A) LAG-3 is upregulated in the peripheral blood of HIV-1–infected individuals. LAG-3 transcripts from peripheral blood RNA of uninfected (n = 7) and HIV-1–infected individuals (n = 27) are quantified by SYBR real-time PCR and compared. A significant upregulation of LAG-3 was observed in HIV-infected subjects compared with that in uninfected subjects (p < 0.01). The Mann–Whitney U test was employed for statistical analyses. (B) LAG-3 is upregulated on CD4+ and CD8+ T cells in HIV-infected subjects naive to ART. Representative flow cytometric plots show LAG-3+ populations in CD4+ or CD8+ populations from representative chronically HIV-1–infected and uninfected subjects. The percentages of LAG-3+ cells in CD4+ and CD8+ T cell populations are grouped and compared between 25 uninfected individuals (HIV−) and 54 HIV-1–infected individuals (ART−, 27 cases with viral load >2000 denoted by a red circle, 27 cases with viral load ≤2000 denoted by a blue circle). Statistical analyses were performed using the Mann–Whitney U test. (C) LAG-3 is upregulated in the lymph nodes of HIV-1–infected individuals. Immunohistochemical staining of LAG-3 expression was performed on lymph nodes derived from five uninfected and three HIV-1–infected individuals. Representative images are shown, with cells positively stained for LAG-3 in brown (original magnification, ×200 as captured by ScanScope). Slides were then digitally scanned at an original magnification of ×200 and the positive cells were quantified as the percentage of brown cells (x-axis) with clearly defined nuclei of the total number of nuclei (stained as blue and shown in the y-axis); representative plots for HIV− and HIV+ subjects are shown. Percentages of LAG-3+ cells in the lymph nodes of five HIV− and 3 HIV+ subjects are grouped and compared. Statistical analysis for the HIV− and HIV+ groups as performed using the Mann–Whitney U test. Error bars represent the mean with the SEM. (D) LAG-3 expression is correlated with the HIV-1 viral load and inversely with CD4+ T cell counts. Real-time PCR analysis of LAG-3 expression was conducted for 27 HIV+ subjects, and the associations between LAG-3 and CD4+ T cell counts or viral loads were analyzed. Statistical analyses were performed using a Spearman correlation test. (E) Patients with high LAG-3 expression progressed more rapidly than did patients with low LAG-3 expression. Kaplan–Meier curves with univariate analyses (log-rank) were created for patients with low LAG-3 expression versus high LAG-3 expression. Forty patients were split into two groups by their LAG-3 expression in CD8+ T cells relative to the median; 20 patients with a higher percentage of LAG-3+ CD8+ T cells were labeled as LAG-3high (solid line), and the remaining 20 patients were labeled as LAG-3low (dashed line). The endpoint for following up was defined as death, the initiation of ART, or a 30% decline in CD4+ T cells within 1 y, which is considered as progression, as previously described in the HIV Treatment Manual (51). Survival was calculated from the date of sample collection for analyses to the date to reach the endpoint. We then quantified LAG-3 expression on CD4+ and CD8+ T cells by flow cytometry in uninfected and chronically HIV-1–infected subjects naive to ART (Table I). The expression of LAG-3 in HIV-infected individuals was dramatically elevated on both CD4+ (p < 0.001) and CD8+ T cells (p = 0.046) compared with the HIV-seronegative group (Fig. 1B), and patients with higher proportions of LAG-3+ cells tended to have higher viral loads (>2000 copies/ml, labeled by a red circle) than those with lower proportions of LAG-3+ T cells (labeled by a blue circle) (Fig. 1B). We also measured the expression of LAG-3 in acutely SIV-infected Chinese rhesus monkeys; similarly, higher levels of LAG-3 were observed on CD3+CD8+ (p < 0.001) and CD3+CD8− T cells (p < 0.001) in acutely SIV-infected rhesus monkeys compared with uninfected rhesus monkeys (Supplemental Fig. 1A). We further investigated the expression of LAG-3 on lymphocytes of the lymph node, which is the primary site of HIV replication (32, 33), using paraffin-embedded tissue sections. Slide sections were derived from five HIV− or three HIV+ lymph nodes (Fig. 1C). As shown in two representative images (left panel), extensive LAG-3 staining was observed in the lymphoid follicle, superficial cortex, and the inter cortex adjacent to the lymphoid follicle around and the medulla on the lymph node section from the HIV+ subject but not the HIV− subject. After all images were digitized, both the number of LAG-3–expressing cells and the signal density of LAG-3 were significantly increased in HIV+ subjects compared with HIV− individuals (p < 0.05) (middle and right panels). To assess whether the expression of LAG-3 was associated with HIV disease progression, we assessed the relationship between the overall LAG-3 mRNA expression and LAG-3 expression on CD4+ and CD8+ T cells by assessing CD4+ T cell counts and HIV plasma viral loads. As shown in Fig. 1D (left panel), LAG-3 mRNA expression, quantified by real-time PCR from 27 HIV-1–infected individuals, was significantly inversely correlated to the absolute CD4+ T cell counts (ρ = −0.46, p = 0.01) and positively correlated with the viral load (ρ = 0.55, p < 0.01). Similar correlations were observed between LAG-3 expression on CD4+ T cells and CD4+ T cell counts (p < 0.001) and the viral load (p = 0.03, middle panel), as well as between LAG-3 expression on CD8+ T cells and CD4+ T cell counts (p < 0.05, right panel). Our result shows that no significant association was identified between LAG-3 expression on CD8+ T cells and the viral load, whereas others reported that LAG-3 expression on HIV-specific CD8+ T cells was negatively correlated with the plasma viral load (34). To test the association of LAG-3 expression with HIV-1 progression, patients were stratified into two groups with either high or low LAG-3 expression. Both the CD4+ T cell counts and viral loads between these two groups did not reach significant differences at the starting point (p = 0.76 for CD4 counts; p = 0.07 for viral loads) (Supplemental Fig. 1B). Interestingly, the patients with high LAG-3 expression had a much more significant effect on the progression of HIV-1; 50% of patients reached the endpoint, whereas only ∼10% patients with low LAG-3 expression reached the endpoint during a 2-y follow-up (Fig. 1E). These findings suggest that LAG-3 is likely involved in HIV-1 pathogenesis and that LAG-3 expression may be a new predictor for HIV-1 progression and survival. To assess the LAG-3–expressing T cell subsets, LAG-3 expression was analyzed in relationship to CD38 and HLA-DR, which are phenotypic markers associated with T cell activation. To characterize whether LAG-3 is coexpressed with other inhibitory or apoptosis-related molecules, we also performed dual staining for LAG-3 and PD-1 or CD95 on both CD4+ and CD8+ T cells. As shown in Fig. 2A, LAG-3+ cells were largely coexpressed with CD38 on 70 ± 9% of CD4+ T cells and 74 ± 17% of CD8+ T cells from 28 HIV-1–infected individuals; the percentage of cells coexpressing LAG-3 with HLA-DR was less, and those with PD-1 and CD95 were much less. These data indicated that LAG-3 was related to continuous T cell activation. LAG-3 is largely upregulated on activated and fully differentiated T cells. (A) LAG-3 is mainly coexpressed with the activation marker CD38. LAG-3+ CD4+ or CD8+ T cells were gated, and the coexpressed surface markers were then examined. The percentages in the plots represent the fraction of double-positive cells for LAG-3 and CD38, HLA-DR, PD-1, or CD95 among LAG-3+ CD4+ or CD8+ T cells. The percentages at the bottom of the plots indicate the mean ± SEM from 28 HIV-infected individuals. (B) LAG-3 is primarily expressed on CD8+ TEMRA and TEM cells. Representative flow cytometric plots show the distribution of LAG-3+ or PD-1+ CD8+ T cells among different T cell subpopulations, as defined by CD45RA and CCR7 (left panel). The population is overlaid onto density plots (black shading) of the total CD8+ T cells. The percentages were calculated as the fraction of cells in each quadrant in total LAG-3+ or PD-1+ CD8+ T cells and compiled in the middle and right panels (n = 53 for LAG-3; n = 28 for PD-1). Most LAG-3+ CD8+ T cells are TEMRA cells, followed by TEM CD8+ T cells, whereas PD-1 is more dominantly expressed on TEM cells. We next assessed the distribution of LAG-3 within the different CD4+ and CD8+ T cell subsets in HIV-1–infected individuals. LAG-3 was coexpressed with CD45RA, as well as with CCR7 to a much lower extent (Fig. 2B, Supplemental Fig. 2A) and defined fully differentiated subsets of CD4+ or CD8+ T cells (effector memory T [TEM] or terminal effector memory T [TEMRA] cells, respectively), which mediated the immediate effector function to induce Ag stimulation. Interestingly, PD-1 was more dominantly expressed on TEM cells for both CD4+ and CD8+ T cells, in agreement with a previous report (35). To examine when LAG-3 is upregulated during activation, we kinetically monitored LAG-3 expression on T cells during anti-CD3/anti-CD28 stimulation in vitro. LAG-3 upregulation in response to anti-CD3/anti-CD28 was observed as early as 24 h after stimulation and progressively increased for at least up to 48 h, followed by a decrease to baseline levels (Supplemental Fig. 2B). Interestingly, most LAG-3+ T cells coexpressed PD-1 during the early activation phase. Only a small fraction of T cells expressed LAG-3 alone, and this fraction displayed different kinetics, with the LAG-3–expressing peak appearing on day 1 (Supplemental Fig. 2C). These data suggest that LAG-3 could be transiently upregulated in response to TCR stimulation. We speculate that the persistent upregulation of LAG-3 during HIV infection might reflect the persistent immune activation of T cells in response to the viral infection. To assess whether effective ART could reduce the elevated LAG-3 expression, longitudinal analysis of the effect of ART on LAG-3 expression in chronic HIV-1 infection was performed. As expected, after prolonged ART (>1 y), LAG-3 expression on both CD4+ and CD8+ T cells significantly declined in the mean fluorescence intensity (MFI) and frequencies of LAG-3+ populations (Fig. 3A). The reduction of LAG-3 expression coincided with the increase in CD4+ T cell counts, as exemplified in two subjects (Fig. 3B). Prolonged ART significantly reduces LAG-3 expression. 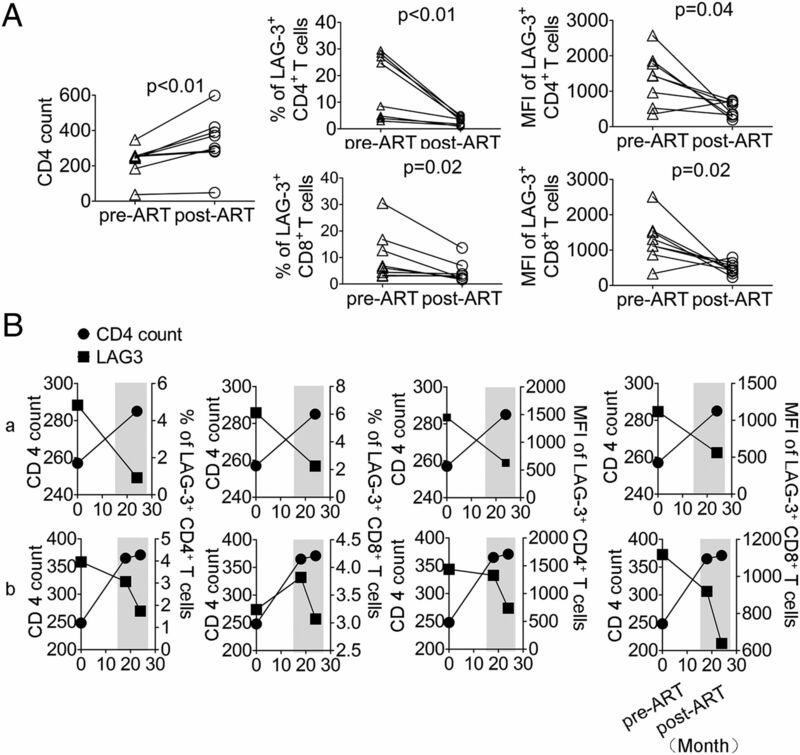 (A) Prolonged ART increases CD4+ T cell counts and reduces LAG-3 expression in both CD4+ and CD8+ T cells. The compiled absolute CD4+ T cell counts and LAG-3 expression on CD4+ or CD8+ T cells in eight patients before and after initiation of ART, as determined by flow cytometry, are shown. Significant decreases of LAG-3 were observed both in CD4+ and in CD8+ T cells both in percentages and in the MFI. (B) Representatives from two patients show that the increase in CD4+ T cells after the prolonged ART is accompanied by the reduction of LAG-3 in CD4+ and CD8+ T cells. We next tested whether the blockade of LAG-3 with its ligands could enhance HIV-specific T cell responses. A recombinant human LAG-3–Fc chimera was used to compete for LAG-3 ligands and to thus block the interaction of LAG-3 with its MHC II ligands during ex vivo stimulation for 24 h. PBMCs from clade B HIV-1–infected subjects naive to ART were incubated with B Gag or CEF peptide pool as controls in the presence of LAG-3–Fc, anti–PD-L1 or isotype control Igs. As shown in Fig. 4A, after B Gag stimulation, the blockade of LAG-3 by LAG-3–Fc fusion proteins significantly enhanced both CD4+ and CD8+ IFN-γ responses compared with the isotype control (p < 0.01 for both) in an IFN-γ–based ICS assay on PBMCs from nine HIV-infected subjects. Stimulation without Gag or with SEB was employed as a negative or positive control, respectively. Interestingly, the blockade by anti–PD-L1 Abs also resulted in an increase in both CD4+ and CD8+ IFN-γ responses compared with the isotype control (p = 0.01 and p < 0.01, respectively). In parallel, the IFN-γ–based ELISPOT assay revealed similar results for LAG-3–Fc- and anti–PD-L1-mediated blockages. In contrast, no significant increase was identified for either LAG-3–Fc- or anti–PD-L1-mediated blockage after CEF peptide pool stimulation (Fig. 4B), indicating that LAG-3–mediated suppression mainly occurs in T cells against an ongoing persistent HIV infection. Blockade of LAG-3 enhanced T cell responses. (A) The blockade of LAG-3 increases the fraction of CD4+ and CD8+ T cells responding to HIV-1 B Gag stimulation. Representative flow cytometry plots show cytokine (IFN-γ) responses to HIV-1 B Gag peptides in the presence of IgG, LAG-3–Fc, or anti–PD-L1 Abs in CD4+ and CD8+ T cells or SEB alone (left panel). Compiled flow cytometry data from 14 chronically HIV-1–infected progressors are shown in the right panel. (B) The blockade of LAG-3 increases spot numbers in CD4+ and CD8+ T cells responding to HIV-1 B Gag stimulation. An ELISPOT assay was performed. Compiled data are shown for HIV-1 B Gag stimulation (n = 14) (upper panel) and CEF peptide stimulation (n = 9) (bottom panel), as well as for the comparison between IgG and LAG-3–Fc (left panel) and for the comparison between IgG and anti–PD-L1 Abs (right panel). (C) The blockade of LAG-3 improves HIV-specific CD8+ T cell proliferation. Representative data show the expansion of CD8+ T cells in response to stimulation with SEB or of HIV-1 B Gag peptides alone or in the presence of IgG, LAG-3–Fc, or anti–PD-L1 Abs. Compiled data from nine subjects were compared between IgG and LAG-3–Fc and between IgG and anti–PD-L1 Abs. Statistical comparisons are conducted using a Wilcoxon signed rank test. (D) The blockade of LAG-3 increases IL-2, IL-10, and TNF-α production. Supernatants were collected from the experiments above (C) and the cytokines IL-2, IL-10, and TNF-α were quantified by using a CBA assay. Compiled CBA data (n = 8) are shown for the comparison between IgG and LAG-3–Fc (upper panel) and between IgG and anti–PD-L1 Abs (bottom panel). The p values are calculated using the Wilcoxon signed rank test. (E) LAG-3 and PD-1 express on different HIV-1–specific IFN-γ+ CD4+ and CD8+ T cell subsets. HIV-1–specific CD4+ and CD8+ T cells are defined as IFN-γ+ T cells after HIV-1 Gag–derived peptide stimulation. 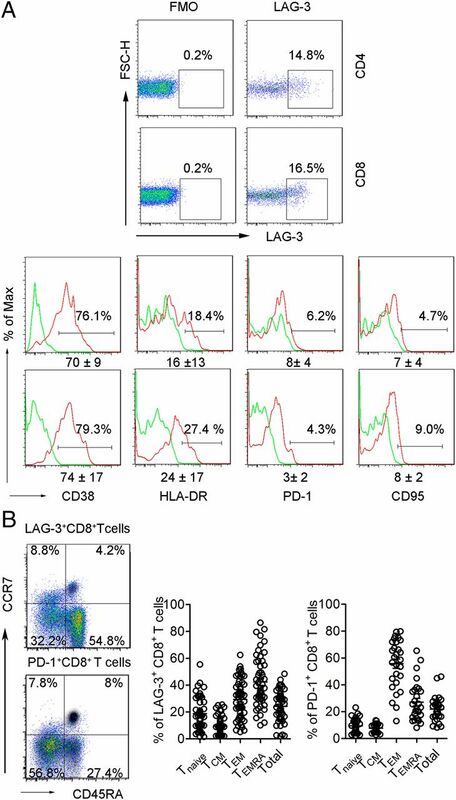 One example of LAG-3 and PD-1 staining in IFN-γ+ CD4+ and CD8+ T cells is shown in the upper left panel, and the percentages of LAG-3 single-positive, PD-1 single-positive, and LAG-3/PD-1 double-positive CD4+ (upper) and CD8+ (bottom) T cells are shown in the right panel; the weight for each population of IFN-γ+ CD4+ and CD8+ T cells is shown in the bottom left panel (n = 8). (F) LAG-3 and PD-1 are expressed on HIV-1 Gag-A*0201 SL9 tetramer+ T cells. HIV-1–specific CD8+ T cells are defined as HIV-1 Gag-A*0201 SL9 tetramer staining–positive T cells in the absence of stimulation. The gating strategy is illustrated in the upper and bottom left panels, and four examples of LAG-3 and PD-1 staining in tetramer+ CD8+ T cells are shown in the upper panel; the percentages of LAG-3 single-positive, PD-1 single-positive, and double-positive CD8+ T cells in HIV-1 Gag-A*0201 SL9 tetramer+ CD8+ T cells are shown in the bottom right panel (n = 14). We next examined whether LAG-3 blockade could also enhance the Ag-specific proliferative capacity of T cells in vitro. PBMCs were labeled with the cell proliferation dye eFluor 670 (eBioscience, 5 μM), incubated with LAG-3–Fc or isotype control Abs plus exogenous IL-2 (50 IU/ml) in the presence of Gag peptides, and analyzed by flow cytometry after 6 d. We showed that LAG-3 blockade resulted in an increase in HIV-specific IFN-γ+CD8+ T (Fig. 4C) and IFN-γ+CD4+ T cell proliferation (Supplemental Fig. 3) in response to Gag stimulation. Furthermore, when a CBA assay was used to quantify the cytokines IL-2, TNF-α, and IL-10 in the supernatants, significant increases were observed after the blockade by LAG-3–Fc or anti–PD-L1 Abs (Fig. 4D). To understand the reasons for the varied enhancing effects of LAG-3–Fc in different subjects and for the observed discrepancies between the blockade of the LAG-3 and PD-1 pathways, we examined LAG-3 and PD-1 expression on HIV-specific CD4+ and CD8+ T cells. Interestingly, HIV-1 Gag-specific CD4+ and CD8+ T cells from different subjects showed varied levels of LAG-3 expression (mean of 20%, ranging from 7.4 to 54%). Most LAG-3 and PD-1 were distributed on different HIV-specific T cell subsets, and only a small fraction of HIV-specific T cells coexpressed both LAG-3 and PD-1 (mean of 5%, ranging from 0.2 to 15.7%) (Fig. 4E). To rule out the potential influence of TCR stimulation on LAG-3 and PD-1 expression, we examined LAG-3 and PD-1 on HIV-1 Gag-A*0201 SL9–specific CD8+ T cells after tetramer staining in the absence of TCR stimulation, and a similar expression pattern was revealed for LAG-3 and PD-1 (Fig. 4F). These data explain the varied effect of the LAG-3–Fc-mediated blockade on the enhancement of T cell immune responses in different HIV-infected subjects, suggesting that LAG-3–Fc and anti–PD-L1 predominantly targeted different T cell subsets. Overall, these data demonstrate that the blockade of the LAG-3/MHC II pathway could enhance HIV-1–specific T cell responses ex vivo and that the LAG-3/MHC II pathway plays an important role in regulating HIV-specific T cell responses during persistent HIV-1 infection. Furthermore, the LAG-3/MHC II pathway could synergize with PD-1/PD-L to enhance T cell–mediated immune responses. To further confirm the role of LAG-3 on T cells, we overexpressed LAG-3 in Jurkat T cells and observed a decrease in IL-2 production in LAG-3–transfected Jurkat T cells compared with sham vector–transfected Jurkat T cells after stimulation with anti-CD3/anti-CD28 Abs (Fig. 5A). To enable functional studies of LAG-3 in primary human T lymphocytes, LAG-3 and the sham vector plasmid were transfected into purified CD8+ T cells. Importantly, when expressed in CD8+ T lymphocytes, LAG-3 was able to reduce IFN-γ production following Gag stimulation compared with the sham vector (Fig. 5B). To further assess whether LAG-3 transduces inhibitory signals, we constructed a fusion gene by fusing the cytoplasmic domain of LAG-3 to the outer membrane fragment of mouse CD28 (designated as hLAG-3-IC/mCD28), which enables the stimulation of LAG-3 via anti-mCD28 Abs. As shown in Fig. 5C, stimulation with anti-mCD28 Abs in addition to anti-hCD3 and anti-hCD28 Abs resulted in the reduction of IL-2 in hLAG-3-IC/mCD28–transfected Jurkat cells. These data demonstrated that LAG-3 transduces an inhibitory signal through its cytoplasmic domain. LAG-3 inhibits T cell function. (A) The transfection of Jurkat T cells with the lag-3 gene reduces IL-2 production in response to anti-CD3/anti-CD28 Ab stimulation. Flow cytometric plots show IL-2 production from unstimulated Jurkat T cells or from anti-CD3/anti-CD28–stimulated vector-transfected or lag-3–transfected Jurkat T cells (upper panel). Compiled data from three independent experiments are shown as percentages (left) or the MFI (right) in the bottom panel. (B) LAG-3 reduced IFN-γ in primary CD8+ T cells of HIV-1–infected individuals. Primary CD8+ T cells from PBMCs of HIV-1–infected patients are electrotransfected with plasmid DNA to express LAG-3 in relationship to GFP; 48 h later, CD8+ T cells were added back to PBMCs that were removed of CD3+ T cells and assessed for IFN-γ responses to HIV-1 B Gag peptides by flow cytometry. Representative data from five independent assays are shown in the upper panel, and pooled data from all five experiments are shown in the bottom panel. (C) The intracellular domain of LAG-3 inhibits IL-2 production in response to anti-CD3 and anti-CD28 Ab stimulation. The intracellular domain of LAG-3 was fused with the extracellular domain of mouse CD28, and this chimeric gene was electrotransfected into Jurkat T cells. Flow cytometric plots show IL-2 production after the stimulation of hlag-3-IC/mcd28–transfected Jurkat T cells with either anti-CD3/anti-CD28 or anti-CD3/anti-CD28/anti-mCD28. Compiled data from three independent experiments are shown. LAG-3 is a CD4 homolog that is required for the regulation of T cell activation, for the maximal function of regulatory T cells, and for the control of CD4+ and CD8+ T cell homeostasis (18–21, 29, 36). The interaction between LAG-3 on T cells and MHC II molecules on APCs delivers a negative signal to downregulate T cell proliferative and cytotoxic activities, thereby restraining the overexpansion of activated T cells and preventing the self-killing of APCs (17, 19, 21, 37). Meanwhile, this interaction also imparts a positive signal to APCs and promotes the maturation of APCs (38, 39), which enables APCs to raise more Ag-specific T cells. Therefore, the LAG-3/MHC II pathway may serve as an “amplifier” for the initiation of immune responses. In this context, the upregulation of LAG-3 on T cells after stimulation represents the “initiator” for the subsequent interaction between LAG-3 and MHC II. In agreement with this hypothesis, we observed the immediate upregulation of LAG-3 upon stimulation, which peaked at days 2–4 in our study, highlighting the important role of LAG-3 during the initiation of Ag-specific T cell–mediated immune responses. Notably, this mechanism would allow the immune system to maximize its usage of APCs to recruit T cells carrying corresponding Ag-specific TCRs, culminating in immune responses within a relatively short period of time. As is known, activated T cells also express MHC II molecules (40, 41), which in turn may bind to LAG-3 on the same T cells and control their activities after those T cells are activated by APCs (21, 29, 42); this is particularly important when those activated T cells contact somatic cells carrying MHC class I (MHC I) but not MHC II molecules and screen for pathogen-derived epitopes in the context of MHC I complexes. The self-carrying MHC II molecules on T cells may generate a threshold for the initiation of activated T cell–mediated killing, preventing the occurrence of autoimmune activities when no pathogen-derived epitopes are present in the binding groove of MHC I molecules. In accordance with this hypothesis, knocking out LAG-3 could cause accelerated and aggravated autoimmune disease (22). In contrast, the presence of pathogen-derived epitopes in the complex of MHC I molecules could result in the high-affinity binding of MHC I/epitope and TCR, thereby transuding an enhanced signal to invoke the killing and elimination of pathogen-infected somatic cells. This mechanism might be hijacked during HIV infection. HIV infection results in persistent viremia, and HIV-derived RNA/DNA and proteins continuously stimulate the innate immune cells and HIV-specific T cells, thereby generating an inflammatory environment and causing the persistent activation of HIV-specific T cells (43, 44). As shown in our data, the stimulation could result in the upregulation of LAG-3; it is possible that the persistent stimulation by both HIV Ags and inflammatory cytokines could result in the extensive upregulation of LAG-3, as evidenced in our primate model of acute SIV infection. Because the lymph node is the primary site for HIV replication (32, 33), it is not surprising that in our study, lymph nodes from HIV-infected subjects showed highly extensive staining of LAG-3, indicating that LAG-3 was more widely expressed during HIV infection in lymph tissues, with the increased number of LAG-3–expressing T cells in the peripheral blood reflecting the events occurring in lymphatic tissues. The containment of HIV replication by ART could decrease LAG-3 expression, as shown in our data. The extensive expression of LAG-3 might have two consequences. The first consequence is the severe attenuation of the immune capacity to contain HIV replication. As known, both CD4+ and CD8+ T cell responses are required to effectively suppress HIV replication (45, 46). Because LAG-3 transduces a negative regulatory signal into T cells, the upregulation of LAG-3 likely impairs T cell functionalities, as demonstrated by both the ELISPOT and ICS assays in this study, and thereby attenuated immune capacity to contain HIV replication. Therefore, the increased LAG-3 expression is likely to correlate with disease progression during HIV infection; this was corroborated by the reverse association with CD4+ T cell counts and the positive association with the viral load in our data. Blockage of the LAG-3 pathway by LAG-3–Fc fusion proteins significantly increased T cell responses, as quantified by IFN-γ–based assays, suggesting that the LAG-3–mediated impairment of T cell functionalities was at least partially reversible and could be recovered by interrupting the LAG-3/MHC II pathway. In this regard, LAG-3, similarly to PD-1 (6, 7, 47), could be considered as a T cell functional regulatory receptor and, as shown in this study, is mainly expressed on effector T cells. The second consequence is enhancement of the threshold to initiate fresh T cell responses. Because LAG-3 transduces a negative regulatory signal into T cells, the extensive expression of LAG-3 on T cells indicated the existence of “bystanding” upregulation of LAG-3 and might lead to a great challenge to raise fresh T cell responses because all dendritic cells, which are the primary APCs for the initiation of T cell responses (48), express high levels of MHC II molecules (49). Under this circumstance, the immune system may fail to initiate a fresh T cell response against a less immunogenic mutated HIV epitope or may require a prolonged period of time to tackle an immunogenic mutant HIV epitope. Similarly, an HIV-infected individual is likely to have difficulty fighting off a subsequent coinfection (47). As previously reported, PD-1 was mainly upregulated in TEM cells (35), whereas LAG-3 was largely expressed on TEMRA and TEM cells. To understand how LAG-3 and PD-1 are coordinated during a persistent HIV infection, we assessed the coexpression of those two molecules. Surprisingly, only a small fraction of T cells coexpressed LAG-3 and PD-1, suggesting that they may play different roles, although both are upregulated during HIV infection and are considered as regulatory molecules. Additionally, PD-1 was shown to associate with both CD38 and HLA-DR (50), whereas LAG-3 coexpressed with CD38, as well as with HLA-DR and CD95 to a much lower extent, further indicating that PD-1 and LAG-3 represent two different functionally impaired T cell populations. Whether these different functionally impaired T cell populations were derived from different lymphatic tissues/sites or represented the same T cell population at different stages during functional exhaustion remains unknown. Overall, we found that LAG-3 expression was significantly more extensive in HIV-infected subjects compared with uninfected individuals. The increased expression of LAG-3 was associated with disease progression and T cell functional impairment. LAG-3 transduces an inhibitory signal into T cells; thus, blocking LAG-3/MHC II interactions ex vivo could, at least in part, revitalize HIV-specific CD8+ T cell functions. LAG-3 and PD-1 represented two different damaged T cell populations. These findings not only extend our understanding of the mechanism of T cell functional exhaustion but also provide a potential therapeutic strategy for HIV-infected patients. We thank the study participants for donating their blood for this study. We also thank Jun Xu for flow cytometry support. Thanks also go to the following people for assistance in coordinating patients for sample collection: Ximing Shi, Jinsheng Wang, Jun Wei, Shaoxian Jia, Shaoping Ning, and Xiujie Lu Yuncheng (Municipal Center for Disease Control and Prevention Shanxi, China); Wangqian Jia, Shaoling Dong, Wei Zhao, Qinghai Yang, Xiaoli Zhao, Lingbo Wang, Hui Wang, and Ailing Zhong (Wenxi County Center for Disease Control and Prevention, Shanxi, China); Baoxing Gao, Xiuzhen Li, Xia Zhang, Weina Feng, Lingling Qi, Bin Wei, Junmiao Zhu, and Qifeng Xu (Xia County Center for Disease Control and Prevention, Shanxi, China); and Jun Ji, Xia Zhang, Tingting Ma, Linna Li, Yanxia Li, and Qinghua Li (Jiang County Center for Disease Control and Prevention, Shanxi, China). This work was supported by National Grand Program on Key Infectious Disease Control and Prevention of China Grants 2012ZX10001-006 and 2013ZX10001-002, 973 National Key Basic Research Project Grant 2014CB542502, the Ministry of Science and Technology of the People’s Republic of China, and National Natural Science Foundation of China Grant 81072496H1014.
. 1986. CD8+ lymphocytes can control HIV infection in vitro by suppressing virus replication. Science 234: 1563–1566.
. 1994. Suppression of HIV replication by CD8+ cell clones derived from HIV-infected and uninfected individuals. Cell. Immunol. 159: 271–279.
. 1989. CD8+ T lymphocyte control of HIV replication in cultured CD4+ cells varies among infected individuals. Cell. Immunol. 119: 470–475.
. 1998. Circulating CD8 T lymphocytes in human immunodeficiency virus-infected individuals have impaired function and downmodulate CD3ζ, the signaling chain of the T-cell receptor complex. Blood 91: 585–594.
. 2013. Molecular signatures of T-cell inhibition in HIV-1 infection. Retrovirology 10: 31.
. 2009. PD-1 and CTLA-4 inhibitory cosignaling pathways in HIV infection and the potential for therapeutic intervention. J. Immunol. 182: 5891–5897.
. 2012. CD160 and PD-1 co-expression on HIV-specific CD8 T cells defines a subset with advanced dysfunction. PLoS Pathog. 8: e1002840.
. 2011. 2B4+ CD8+ T cells play an inhibitory role against constrained HIV epitopes. Biochem. Biophys. Res. Commun. 405: 503–507.
. 2011. B and T lymphocyte attenuator down-regulation by HIV-1 depends on type I interferon and contributes to T-cell hyperactivation. J. Infect. Dis. 203: 1668–1678.
. 1990. 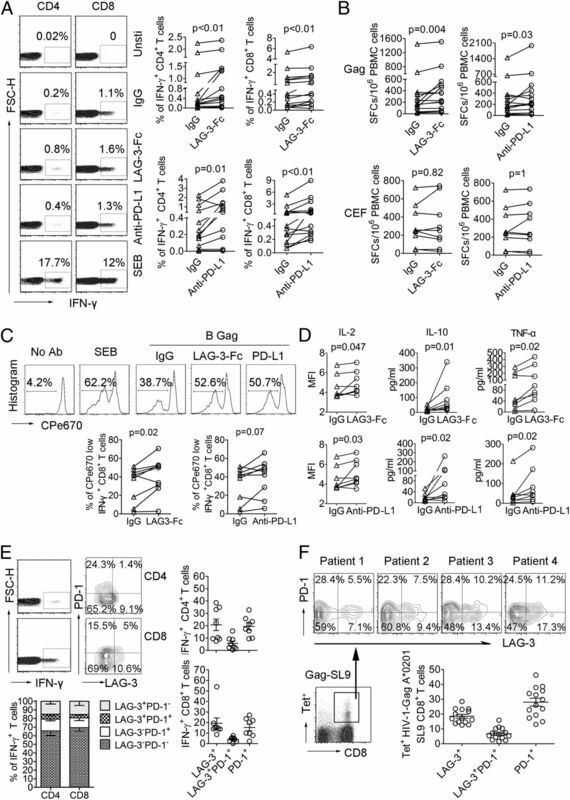 LAG-3, a novel lymphocyte activation gene closely related to CD4. J. Exp. Med. 171: 1393–1405.
. 2007. LAG-3 regulates CD8+ T cell accumulation and effector function in murine self- and tumor-tolerance systems. J. Clin. Invest. 117: 3383–3392.
. 2002. Cutting edge: molecular analysis of the negative regulatory function of lymphocyte activation gene-3. J. Immunol. 169: 5392–5395.
. 2003. The CD4-related molecule, LAG-3 (CD223), regulates the expansion of activated T cells. Eur. J. Immunol. 33: 970–979.
. 1994. Lymphocyte-activation gene 3/major histocompatibility complex class II interaction modulates the antigenic response of CD4+ T lymphocytes. Eur. J. Immunol. 24: 3216–3221.
. 1998. CD3/TCR complex-associated lymphocyte activation gene-3 molecules inhibit CD3/TCR signaling. J. Immunol. 161: 4058–4065.
. 2011. Cutting edge: accelerated autoimmune diabetes in the absence of LAG-3. J. Immunol. 187: 3493–3498.
. 2012. Immune inhibitory molecules LAG-3 and PD-1 synergistically regulate T-cell function to promote tumoral immune escape. Cancer Res. 72: 917–927.
. 2011. PD-1 and LAG-3 inhibitory co-receptors act synergistically to prevent autoimmunity in mice. J. Exp. Med. 208: 395–407.
. 2012. Therapeutic blockade of PD-L1 and LAG-3 rapidly clears established blood-stage Plasmodium infection. Nat. Immunol. 13: 188–195.
. 2010. LAG-3 expression defines a subset of CD4+CD25highFoxp3+ regulatory T cells that are expanded at tumor sites. J. Immunol. 184: 6545–6551.
. 2006. Expression of LAG-3 by tumor-infiltrating lymphocytes is coincident with the suppression of latent membrane antigen-specific CD8+ T-cell function in Hodgkin lymphoma patients. Blood 108: 2280–2289.
. 2007. Identification of a human CD8+ regulatory T cell subset that mediates suppression through the chemokine CC chemokine ligand 4. Proc. Natl. Acad. Sci. USA 104: 8029–8034.
. 2004. Lymphocyte activation gene-3 (CD223) regulates the size of the expanding T cell population following antigen activation in vivo. J. Immunol. 172: 5450–5455.
. 2014. IFN-stimulated gene LY6E in monocytes regulates the CD14/TLR4 pathway but inadequately restrains the hyperactivation of monocytes during chronic HIV-1 infection. J. Immunol. 193: 4125–4136.
. 2001. T Lymphocytes infiltrating various tumour types express the MHC class II ligand lymphocyte activation gene-3 (LAG-3): role of LAG-3/MHC class II interactions in cell-cell contacts. Eur. J. Cancer 37: 1709–1718.
. 1991. Lymphoid germinal centers are reservoirs of human immunodeficiency virus type 1 RNA. J. Infect. Dis. 164: 1051–1057.
. 1993. HIV infection is active and progressive in lymphoid tissue during the clinically latent stage of disease. Nature 362: 355–358.
. 2014. Lymphocyte activation gene-3 expression defines a discrete subset of HIV-specific CD8 T cells that is associated with lower viral load. AIDS Res. Hum. Retroviruses 30: 535–541.
. 2007. PD-1 up-regulation is correlated with HIV-specific memory CD8+ T-cell exhaustion in typical progressors but not in long-term nonprogressors. Blood 109: 4671–4678.
. 2005. Negative regulation of T cell homeostasis by lymphocyte activation gene-3 (CD223). J. Immunol. 174: 688–695.
. 2005. The negative regulatory function of the lymphocyte-activation gene-3 co-receptor (CD223) on human T cells. Immunology 115: 170–178.
. 2002. Maturation and activation of dendritic cells induced by lymphocyte activation gene-3 (CD223). J. Immunol. 168: 3874–3880.
. 2003. MHC class II signal transduction in human dendritic cells induced by a natural ligand, the LAG-3 protein (CD223). Blood 102: 2130–2137.
. 1988. T cells can present antigens such as HIV gp120 targeted to their own surface molecules. Nature 334: 530–532.
. 1994. Professional presentation of antigen by activated human T cells. Eur. J. Immunol. 24: 71–75.
. 1992. Characterization of the lymphocyte activation gene 3-encoded protein. A new ligand for human leukocyte antigen class II antigens. J. Exp. Med. 176: 327–337.
. 2013. The paradox of the immune response in HIV infection: when inflammation becomes harmful. Clin. Chim. Acta 416: 96–99. 2010. Pathogenesis of HIV infection: total CD4+ T-cell pool, immune activation, and inflammation. Top. HIV Med. 18: 2–6.
. 2001. Suppression of HIV replication in the resting CD4+ T cell reservoir by autologous CD8+ T cells: implications for the development of therapeutic strategies. Proc. Natl. Acad. Sci. USA 98: 253–258.
. 2001. Naive CD4 T cells inhibit CD28-costimulated R5 HIV replication in memory CD4 T cells. Proc. Natl. Acad. Sci. USA 98: 11644–11649.
. 2011. Revisiting immune exhaustion during HIV infection. Curr. HIV/AIDS Rep. 8: 4–11.
. 1997. Inflammatory stimuli induce accumulation of MHC class II complexes on dendritic cells. Nature 388: 782–787.
. 2007. PD-1 expression on human CD8 T cells depends on both state of differentiation and activation status. AIDS 21: 2005–2013. Panel on Antiretroviral Guidelines for Adults and Adolescents. 2011. Guidelines for the Use of Antiretroviral Agents in HIV-1-Infected Adults and Adolescents. Department of Health and Human Services, Washington, DC. Available at: http://www.aidsinfo.nih.gov/ContentFiles/AdultandAdolescentGL.pdf.